We provide a Breakfast Club which is available to all our children and is open every morning, Monday to Friday, from 8.00 to 8.50am. The Breakfast Club is run by two staff members who have had lunchtime supervisor roles within the school and know our children and families well. The cost of attending the Breakfast Club is £2 per day. 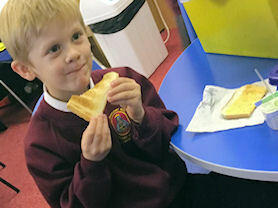 Your child can choose from toast, a selection of cereals, juice and milk. Our children have access to board games, construction sets and books; they can complete homework or spend quality time with their peers. If you wish your child to attend Breakfast Club, please bring them to the club in the morning at 8.00am. You will be asked to complete a registration form on the first day that your child attends. Entrance to Breakfast Club is via the main entrance and there is a bell for admittance. A member of the Breakfast Club Team will let you and your child in. Breakfast Club is located in the Family Learning Room. Breakfast Club must be paid for in cash, every morning or in advance. 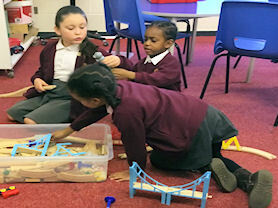 At 8.50am your child will be accompanied to class by a member of the Breakfast Club Team if they are in Nursery or Reception. 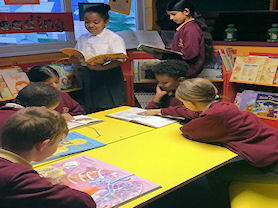 Children from Year 1 onwards return to class independently. Opportunities to read after breakfast. Enjoying toast and apple juice. Time to build and work together.